The central as well as the state governments have realized that for the overall development of the nation and the respective states, educations must be made easily available to all. But poor people in rural as well as urban areas fail to send their children to schools due to several constraints. Thus, states come up with many developmental schemes, targeted towards students. After several educational schemes, Tamil Nadu government has launched yet another project that will offer free bicycles to students. The name of this scheme is Free Bicycle Scheme. Free Bicycle to students – Many poor students are forced to leave schools as they live very far from the institute. The free bicycle will help them to cover the distance easily. It is also an act of encouragement from the state government for the students. Govt School and ITI students – Candidates who study in govt schools will get the benefit under this project. 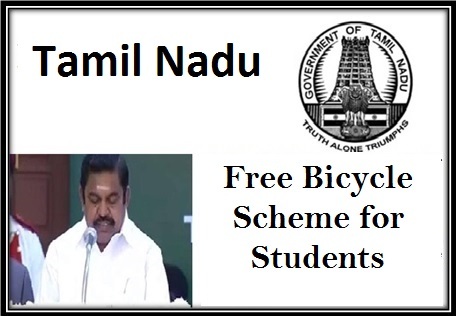 Apart from schools, candidates, studying in industrial training institutes or ITIs in the state will be able to apply and get this free bicycle from the Tamil Nadu government. For current academic year – The state government will soon start the application process for 2018 -2019 academic year. This year, CM inaugurated the scheme by handing over nine free bicycles to eligible candidates. Total number of beneficiaries – A rough estimates states that 11.78 lakh applicants can get the benefits of this scheme. This figure consists of 5.06 lakh male students and 6.49 lakh female students from schools. Around 18,506 applicants from ITIs will be able to get this free bicycle as well. Only for government schools – Only students who have taken admission in government run educational institutes will be able to apply for the free cycle. Industrial training students – All state run industrial training organizations will also be included under this program. Residents of the state – These students must be legal residents of Tamil Nadu. To get the free cycle, applicants must submit their residential certificate. Academic papers – As the scheme will only allow students to apply, these candidates must attach their respective educational certificates with the enrollment form. Aadhar card – Submission of a photocopy of the Aadhar card is a must. It will offer personal details of all applicants to the scrutiny officers. The scheme has only been implemented in the state. The respective authority has not highlighted anything about the application process of the enrolment forms. In due time, all necessary information will be published on the official portal. You will get all the scheme- related details on this site soon. The Tamil Nadu government will have to shell out as much as Rs 437.86 crore to offer free bicycle to the estimated number of students. A small encouragement from the state government will go a long way to boost educational among the students. The literacy rate in this state is higher than many other Indian states. The present state government desires to increase this literacy index in years to come. Thus, the implementation of this scheme will bring a smile on the faces of poor and needy students.